IgoriaCard gives the possibility of paying inmore than 120 currencies all over the world – automatically adjusts to local currency of country you’re in. IgoriaCard currency exchange will automatically exchange the currency for You at the best rate. or makes an automatic FX transaction at the best possible rate. IgoriaCard has made it easier for our company to settle payments, in particular those made during business trips. Automated system allows to control company’s expenses and to minimize its costs. I made the decision to order IgoriaCard right after I found out that there are 17 currencies on one card. By having the access to a multicurrency wallet, I can quickly pay with a card not only on the Internet, but also abroad. I have only one card for all kind of payments – it’s really convenient! IgoriaCard is worth recommending to all people who make daily transactions in different currencies. We settle with counterparties in a variety of currencies. It took us a long time to find a solution that will help reduce the costs of transactions and currency exchange. 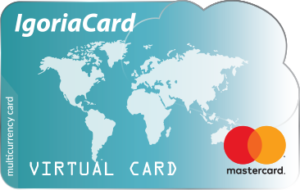 Thanks to IgoriaCard we can settle with our business partners all over the world, exchange currency at favorable rates and use virtual multicurrency cards to settle daily payments.